FRANK ANTHONY OBERMAN was born on August 25, 1890 to William and Tekla Oberman in Philadelphia. 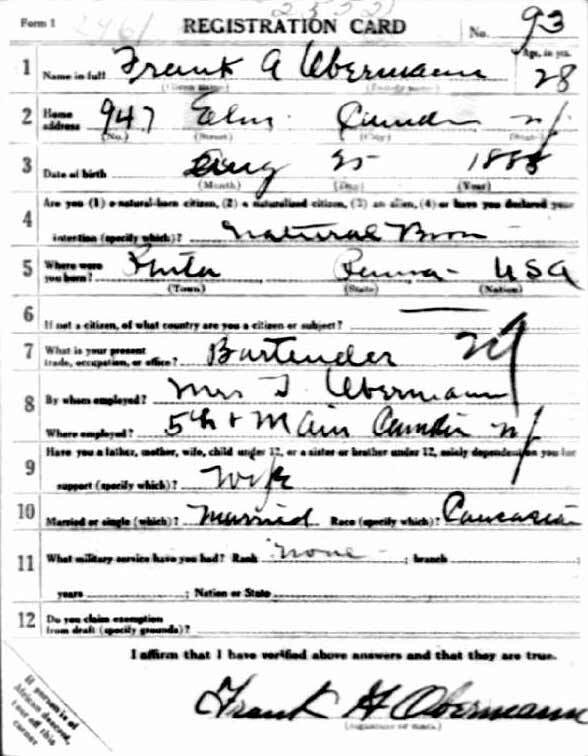 The family name was originally spelled Obermann, and different documents show the name spelled both ways. His parents were born in Germany. They came to America in 1882. His father was a saloonkeeper, and the family remained in the bar business in Camden for five decades. 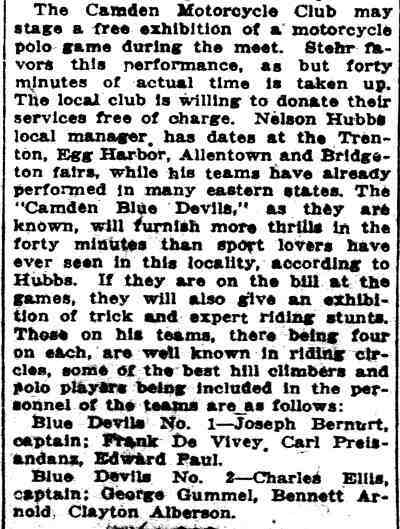 They appear to have moved to Camden in 1895, as they first appear in City Directories in 1896. The 1896 City Directory and the 1900 Census shows the family living at 1618 Ferry Avenue, near the corner of Ferry Avenue and Jackson Street. Besides Frank the family included older brother William Jr. 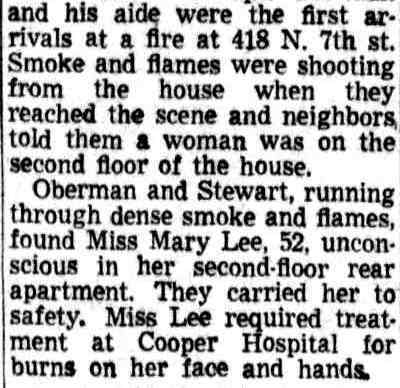 The Obermans were still at 1618 Ferry Avenue as late as 1904. By 1906 the Obermans had moved to 505 Main Street in North Camden where they operated a bar that would come to be known as the Main Cafe. The bar was still in the family's hands as late as 1947. 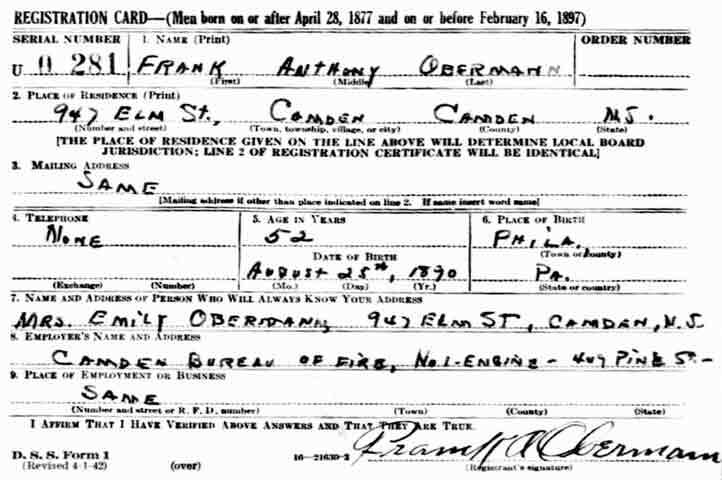 Frank Oberman worked in the family business as a bartender as late as June of 1917, when he registered for the draft..
Frank Oberman married Emily McQueen not long after registering for the draft. They were living at 947 Elm Street with Emily's son, Herbert and Walter when the 1919 Camden City Directory was compiled. 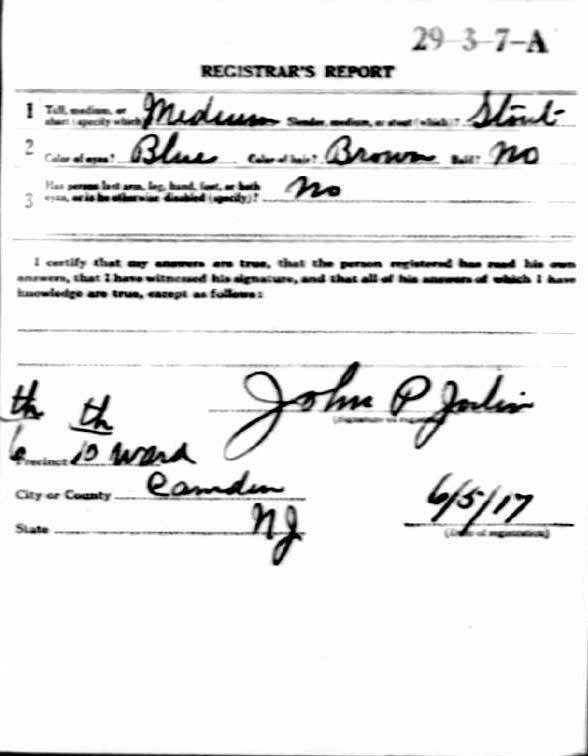 According to the 1920 Census, he worked as a "machine hand" at the Victor Talking Machine Co. factory in Camden before going to work as a fire fighter. 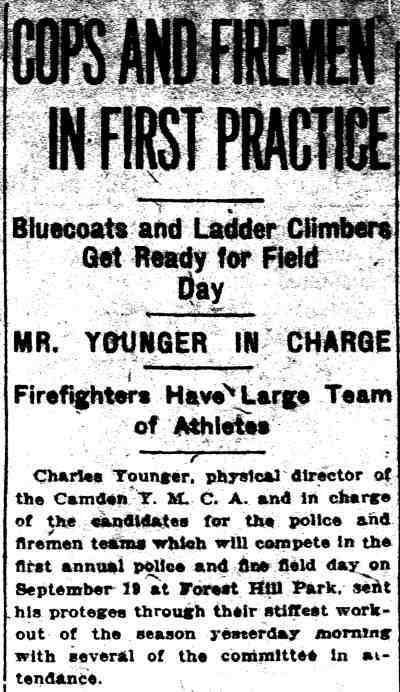 He was appointed to the Camden Fire Department on November 23, 1920, and reported for duty on January 1, 1921 with Engine Company 4. 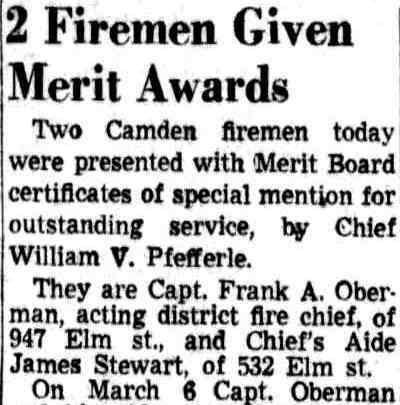 He was serving with Engine Company 10 when promoted to Junior Captain in 1940, and with Engine Company 1 when promoted to Senior Captain in February of 1943. 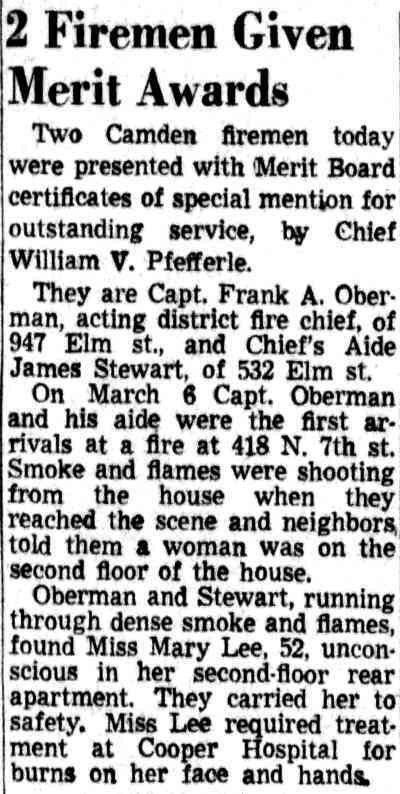 From October 1, 1944 through September 1, 1945 Frank Oberman worked as Acting Battalion Chief, and from December 16, 1949 through November 1, 1953 he served as Acting District Chief. He was transferred to the Fire Marshal's office on March 1, 1955 and retired on June 1, 1955. Frank A. Oberman Lived out his days at 947 Elm Street. He died in March of 1965, survived by his wife, Emily G. Oberman, and a stepson, Walter McQueen. Brother firefighter Harry Kleinfelder boarded with Frank and Emily Oberman from the late 1920s until his death in 1958. Commissioner Mary W. Kobus yesterday announced a number of changes in the fire department, including the disbanding of Truck Company No. 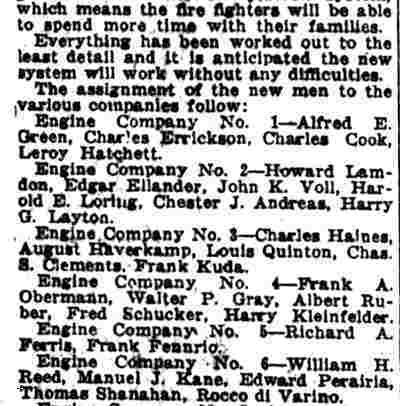 4; creation of a new engine company. No. 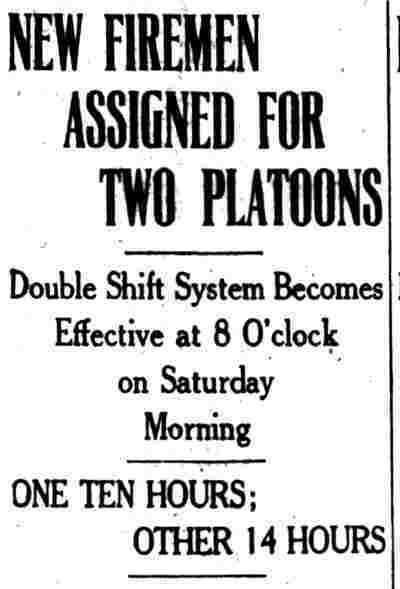 10, and the transfer of 18 officers and men, 12 of them captains. Most of the new captains have been serving as acting captains and promotion to full rank will involve no pay increases, inasmuch as the men signed waivers foregoing the raises. Commissioner Kobus explained most of the changes were made to conform with regulations of the National Board of Fire Underwriters. The board, Mrs. Kobus explained, made a survey of the department and advised appointments of acting captains to full rank. 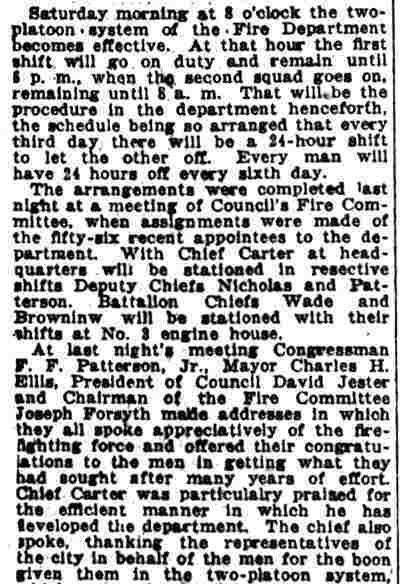 The commissioner also announced she had appointed Junior Captain Raymond Smith as director of the school for firemen at Engine Company No. 10, Ninth and Morgan streets. Smith, one of the youngest at the recently appointed junior captains, will succeed the late Battalion Chief Rollo Jones. Senior Captain Leonard Megee was appointed acting battalion chief to succeed Jones. He will continue at the Fifth and Arch streets fire headquarters. Junior Captain William Spencer, of headquarters company, was named relief captain. company, at Ninth and Morgan streets. 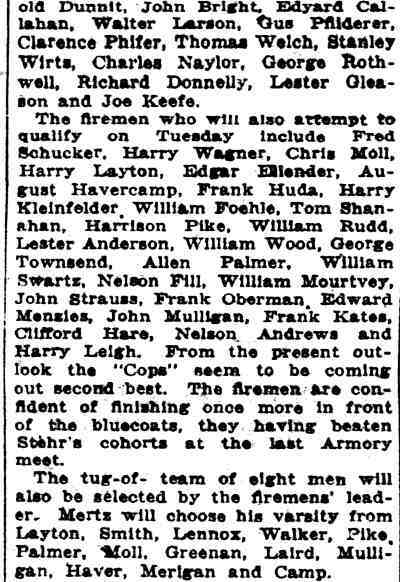 To the new company Mrs. Kobus assigned Senior Captain Mortica Clark and Firemen Frank Burt, Frank Esperance and Clifford Lane. 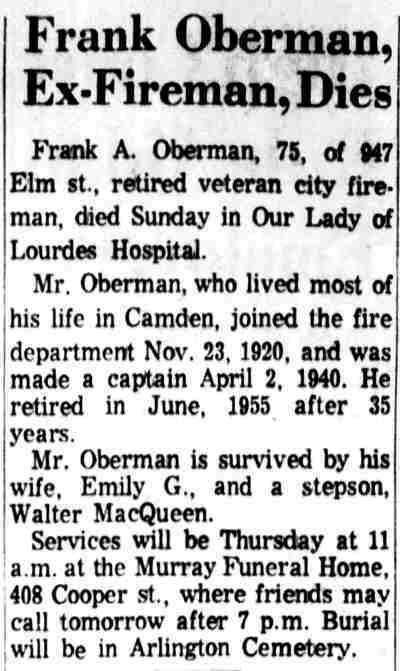 Junior Captain Frank Oberman was transferred from Engine Company No. 10 to Engine Company No. 1, at fire headquarters. Junior Captain Robert Wonsetler, Engine Company No. 11, to Engine Company No. 2. 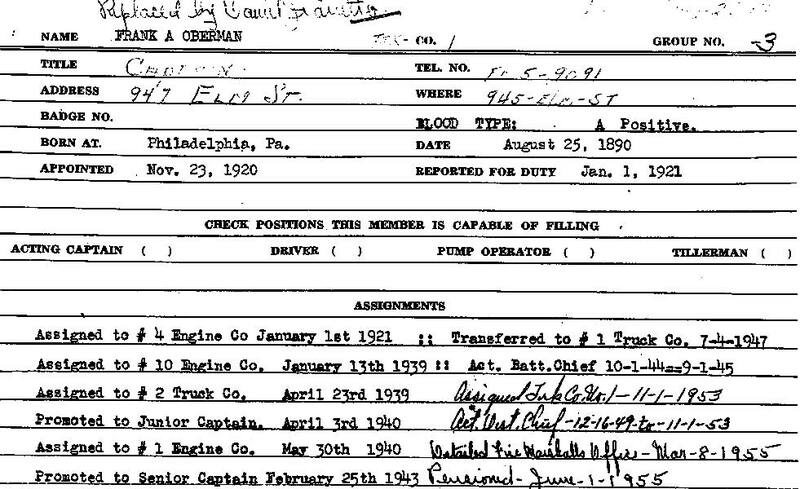 Junior Captain Edgar Ellender, Engine Company No. 2, to Engine Company No. 6. Junior Captain Ralph Bingemann, Truck Company No. 2, to Engine Company No. 7. Fireman David Humphries, Truck Company No. 3, to Engine Company No. 11. 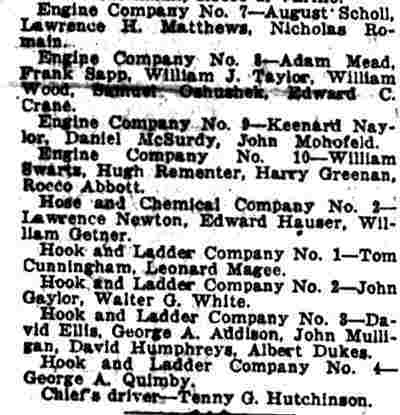 Junior Captain Nelson Andrews, Engine Company No. 2, to Truck Company No. 1. Fireman Albert Dukes, Jr., Truck Company No. 1, to Engine Company No. 2. 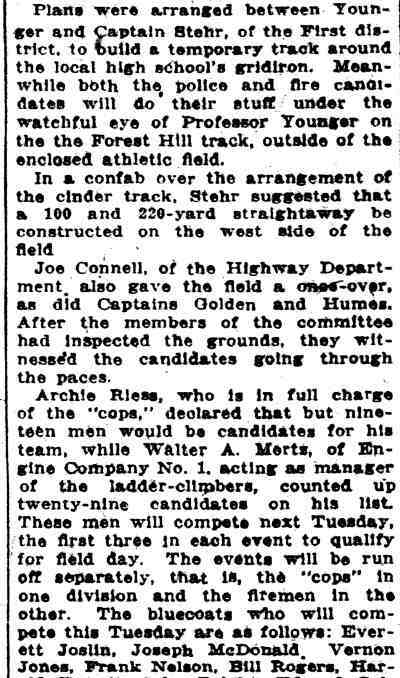 Junior Captain Winfield Levisuer, Truck Company No. 2, to Truck Company No. 3. Junior Captain Edward McDowell retains assignment to Engine Company No. 3. Junior Captain Maurice O’Brien assigned to Engine Company No. 10. The changes were contained in notice to the Civil Service Commission, are effective as of June 1 and will appear on the June 15 payroll.